SANCA’s Annual Spring Showcase – SASS! Every year SANCA presents a showcase of unique circus and variety performances featuring students, alumni, staff, and friends of SANCA. For one weekend only in May, we hold four shows, each featuring a different line up of spectacular local and internationally renowned circus performers alongside SANCA’s tremendously talented student performers. With festive musical accompaniment by Doc Sprinsock & the SANCApators, audiences will be treated to daring displays of acrobatics, high-flying aerials, rolling globe ensembles, juggling, and more! And many more talented artists! 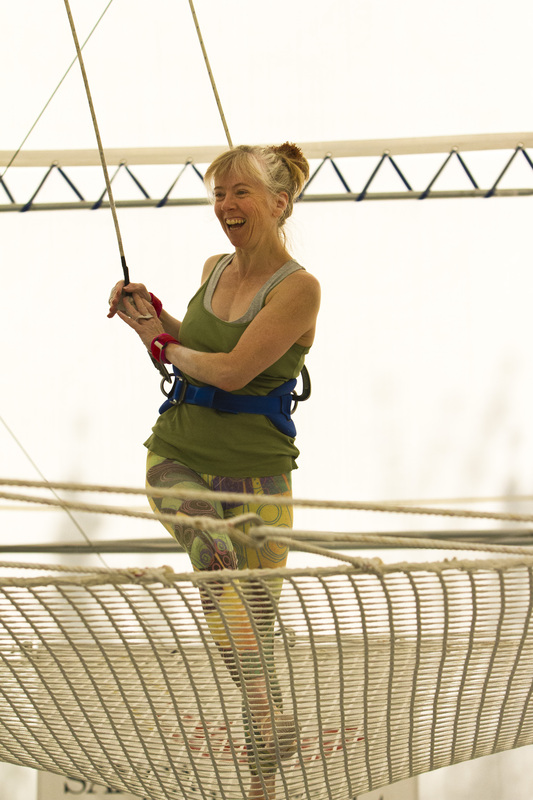 Join us in the SANCA School of Flight flying trapeze tent for the Festival of Flight: Open House and Spring Fly show Extravaganza! From 1-3pm each day we welcome flyers ages 4 and up to bring a non-perishable food item to support the Rainier Valley Food Bank & take one free swing during the open house! One turn per person. No advanced reservations. Flyer must be present to sign up for a turn. On Saturday May 2nd, at 3pm we will welcome you to watch our Mini & Junior & Teen Fly Teams perform feats of derring do and amazing aerial tricks! We welcome you back to the tent again at 7pm for our Adult Team to show off their stuff. On Sunday May 3rd, at 3pm we will invite you to watch our Adult Team perform acrobatic aerial tricks. Return to the tent again at 7pm to watch our Mini & Junior & Teen Fly Teams as they fly, twist, flip and dive through the air. Lunch and treats will be available for purchase from some of Seattle’s favorite Food Trucks! IMPulse Circus Collective, a Seattle-based circus troupe founded in 2013, will debut a new contemporary circus show as a part of the Moisture Festival. Shows will be at Broadway Performance Hall in Capitol Hill on April 10-12. This exciting, acrobatic show is appropriate for audiences of all ages. Figments transports the audience into a world populated by imaginary friends that have been forgotten by the children who imagined them. This quirky group of imaginary friends must navigate the real issues of finding a place to belong in a make-believe world. Performers fly through the air and showcase amazing feats of acrobatic grace, strength, and beauty as they weave a whimsical tale. IMPulse Circus Collective, artists-in-residence at Seattle’s School of Acrobatics & New Circus Arts, presented their first self-titled show in 2013, and returned in 2014 with their production entitled Bonkers. Members of IMPulse Circus have performed on stages and in circus rings throughout the world. They draw inspiration from the worlds of contemporary circus, vaudeville, and theater to create accessible and exciting circus shows. Featuring artists Arne Bystrom, Emma Curtiss, Jasmine Manuel, Jonathan Rose, Marta Brown, Nick Harden, Reed Nakayama, Wendy Harden, and Zora Blade. Tickets are $10 for youth, $15 for seniors, and $25 for adults. Tickets can be found at moisturefestival.strangertickets.com. More information about IMPulse Circus Collective can be found at impulsecircus.com. Acrobatic Conundrum premieres “the Language of Chance”: two takes on contemporary circus, one extraordinary evening of new works. 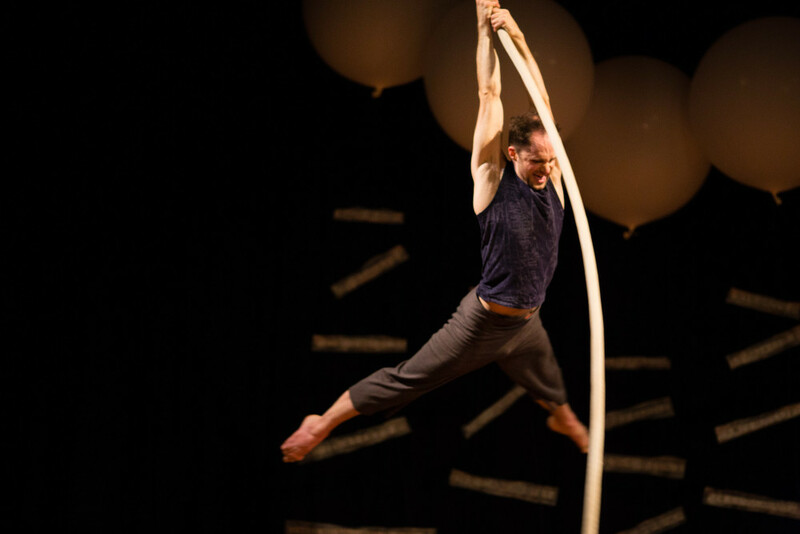 Since its debut in 2012 Acrobatic Conundrum has taken artistic risks to inspire and connect with audiences through the medium of circus arts. “The Language of Chance,” follows suit on a grander scale, with two new works created exclusively for the troupe. Both pieces are inspired by themes from an enigmatic story from magical realist author Jorge Luis Borges, The Library of Babel. Seattle choreographer/director KT Niehoff created the first piece, “A Book is not a Ladder,” in which contemporary dance and circus meld in a visually stunning world. Niehoff designed the striking set and costumes, and made the original sound score in collaboration with electronic musician Pietro Ravanni. In the piece, the acrobats find themselves at odds between the sensations of falling forever, and the Sisyphean task of looking for story in a nonsensical world. Elizabeth Klob—director of the UMO Ensemble—created the second piece in collaboration with the company. The work evokes a tale of missed connections and serendipitous endings, told using through physical theater, clown, and circus arts. With an original scenography and additional music by Ravanni, the piece transports viewers on an unexpected, labyrinthian journey. This group of acrobats blur the lines between dance, theater, and circus, inventing their own form of storytelling. This piece is the must-see circus event of the season. Wasting away tells the exciting and bizarre story of an idyllic small town that is slowly overrun by their accumulation of garbage. Seemingly oblivious to their predicament the town carries on with its joyous and acrobatic daily routine until the problem becomes too big to ignore. Full of humour and heart, this show presents an action-packed tale of conflict, growth, and cooperation that simultaneously offers social commentary and manages not to take itself too seriously. Wasting Away includes all-new original acts on the Chinese pole, high flying partner acrobatics, tumbling, aerial fabric, contortion, club juggling, aerial rope, clowning, and much more. Wasting Away is created and devised by the Directors and members of Cirrus Circus, with additional dance choreography by Rachel Randall, aerial choreography by Bridget Gunning, costume design by Milla Voellinger, set by Morgan Sobel, acrobatics consulting from Jacob Skeffington and select originally composed music by Tristan Moore. Join us for our first Summer Circus Festival, August 15-24, 2014, including the SANCA Staff Show, “Everyday Miracles” and SANCA Goes Late Nite Variety Shows, curated and directed by David Crellin aka Armitage Shanks. SANCA’s staff show, “Everyday Miracles”, transforms everyday actions through the beauty of circus, elevating the mundane into the marvelous. Circus artists are superheroes performing these little miracles every day, affecting other people, spreading mystery and joy. Audiences will be treated to the beauty and athleticism of contemporary circus arts. Festival performers include: Tanya Brno, Kari Hunter, Acrobatic Conundrum, Adrienne Jack-Sands, Oliver Parkinson, Armitage Shanks, IMPulse Circus Collective , Sara Sparrow, Vivian Tam, Jill Marissa, Scotty Walsh, Lara Paxton, Mick Holsbeke and many more talented artists. SANCA goes Late Nite, an evening of raucous thrills with live music & special guests, including: Vivian Tam, Adra Boo, Duo Finelli, Marta Brown, Esther deMonteflores-Webner/Laura Burch, Bridget Gunning, Tanya Brno, Professor Scotty Walsh, Jenny Penny, Caela Bailey, Nash Fung, Florial, with music by Bucharest Drinking Team on August 15th and by Chaotic Noise Brigade on August 22nd. SANCA Summer Circus Festival is August 15th – 24th, 2014. SPONSORS These shows are supported by grants from 4Culture and the Office of Arts & Culture | Seattle. SANCA is honored to present our talented staff in their own show. Everyday Miracles, transforms everyday actions through the beauty of circus, elevating the mundane into the marvelous. Circus artists are superheroes performing these little miracles every day, affecting other people, spreading mystery and joy. Artists performing in the SANCA Staff Show include: Rachel Randall & Nick Lowery, Bridget Gunning, Professor Scotty Walsh, Noa Schnitzer, Leslie Rosen, Mick Holsbeke, Zach Holmbergh, Orville Zharoff & Lauren Kettner. SANCA resident collective Acrobatic Conundrum will be appearing as the second half for the weekend of August 15-17. IMPulse Circus Collective will be appearing as the second half for the weekend of August 22-24. Also part of the Festival: SANCA is proud to produce it’s first late night variety show directed by David Crellin aka Armitage Shanks. An evening of raucous thrills with live music & special guests. Our Friday August 15th Show includes: Armitage Shanks, Marta Brown, Esther de Monteflores & Laura Burch, Nash Fung, Duo Finelli, Jenny Penny, Miss Adra Boo, Professor Scotty Walsh, Bridget Gunning with live music by Bucharest Drinking Team. Professor Scotty Walsh, Bridget Gunning, Tanya Brno, Duo Finelli, Vivian Tam & Gunnar Field, Esther de Monteflores & Laura Burch, Jenny Penny, Armitage Shanks, Marta Brown, with live music by Chaotic Noise Brigade. Take a break from fall doldrums and treat yourself to a splash of early spring with this high-energy, acrobatic show. Follow the characters of Cirrus Circus as they each discover their own distinctive personality, evolving from a monochrome daily drab to a prismatic burst of colors. 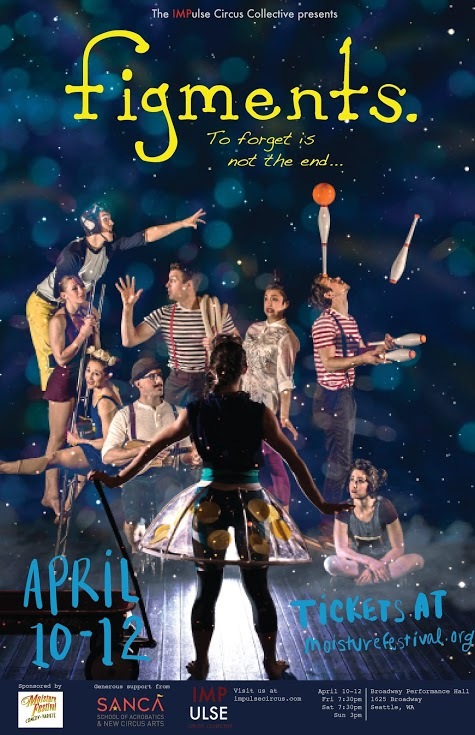 Cirrus Circus (formerly the Youth Performance Company) is one of the most accomplished circus troupes in the region, and is in demand at many of Seattle’s popular festivals and events, including Moisture Festival, Seattle Center’s Winterfest, the Georgetown Carnival, and more. Cirrus Circus has been invited to perform in 2014 at the London International Youth Circus Festival in England, and InselCircus in Sylt, Germany. 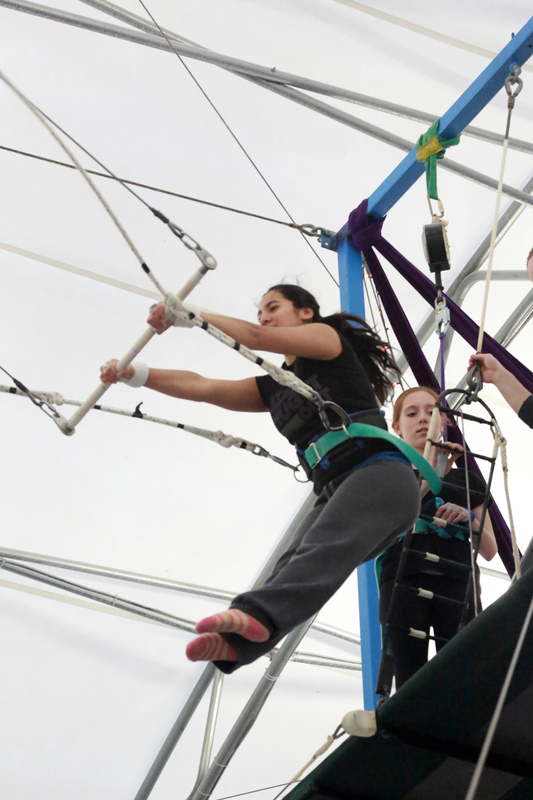 Full Spectrum includes all-new original acts on the triple trapeze and the trampoline, as well as aerial contortion, acrobatic unicycle, juggling, tumbling, partner acrobatics, and much more. This show also features guest performances by SANCA’s younger performing ensembles, the Amazing Circus 1-ders and the Magnificent 7. Full Spectrum is created and devised by the members of Cirrus Circus, with additional choreography by Rachel Randall of RandAll Dance. A slap. A scream. A kiss. We are standing at the edge of the precipice. Artists in residence & staff of SANCA present a contemporary circus show exploring the Imp of the Perverse, a short story by Edgar Allen Poe. With original score and live music by Caleb Corey. SANCA is proud to be presenting these talented artists. As all SANCA shows, this is a family friendly production while being a bit edgier and intense than the typical SANCA show. Set against the backdrop of The Great Depression, Falling Upward is a celebration of the endurance and the creativity of the human spirit. The show is a tribute to the challenges and triumphs of everyday people as well as to iconic artists and works of the 1930s. This exciting collaboration showcases an amazing variety of traditional and modern circus arts, including acrobatics, tight-wire walking, juggling, Chinese pole, hand balancing, aerial acts, and more. Come see some of your favorite SANCA coaches perform in this all-new show! Performances include Arne Bystrom and Zora Blade performing a hand-to-hand acrobalance duet; Duncan Davenport with amazing trick roping; Nick Lowery defying gravity on the Chinese Pole; and many more.